Hi Power. Take a true classic to the range. When it was introduced early in the 20th century, the Browning Hi Power 9mm pistol was a revelation. It offered the perfect balance of handling, size and firepower, Over the years, the Hi Power has aged gracefully and continues to have a loyal following among those “in the know.” Whether you are a novice or a seasoned shooter, you will appreciate the fine craftsmanship and function of these classic pistols, the sure heft of the machined steel frame and slide, and their natural pointability. Even with the double-column magazine, the grip is narrow to neatly accommodate nearly every hand size, and the single-action trigger provides a smooth, consistent pull. As reliable, accurate and easy to shoot as ever. Sure, there are many, many other full-size 9mm pistols on the market that are made to meet many different requirements. But in the end, every true firearm enthusiast should have a Hi Power in their collection. Having and shooting the best just means something. A legend you can rely on. The Browning Hi Power is one of the most revered pistols of all time. This ground-breaking firearm was originally designed by John M. Browning and perfected in the years following his death by Fabrique Nationale’s prolific designer, Dieudonne Saive. The Hi Power has proven itself around the world in the hands of law enforcement, military, special operations forces and law abiding citizens. 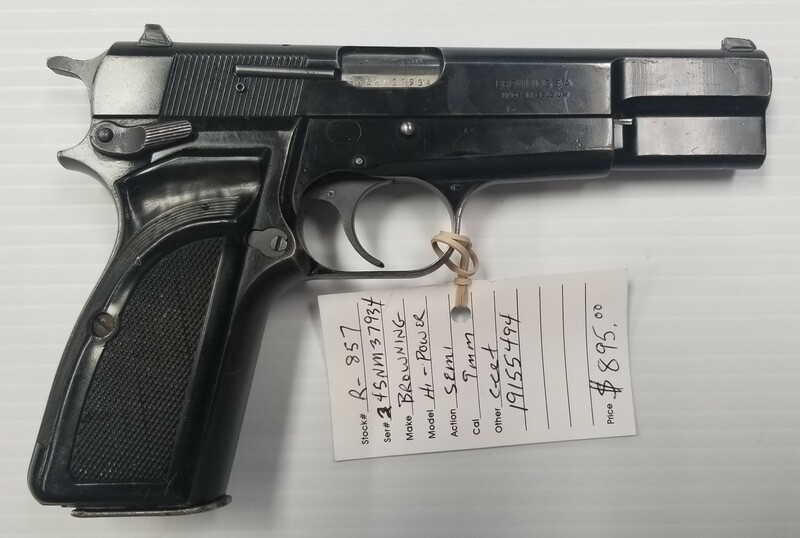 Add a legendary piece of functional firearm history to your collection now with a 9mm Browning Hi Power. A large, ambidextrous manual thumb safety is conveniently located just above the grip.